- Using a large bowl, add the 4 cups of confectioners sugar. - Pour in the boiling water one tablespoon at a time until you see the mixture both thick, but still spreadable. - Brush half the chocolate frosting onto one side of the cookie and the vanilla frosting on the other. 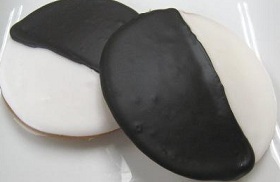 "If your a sienfeld fan, then you will surely love this black and white cookie recipe. Takes a little longer to make, but well worth it.